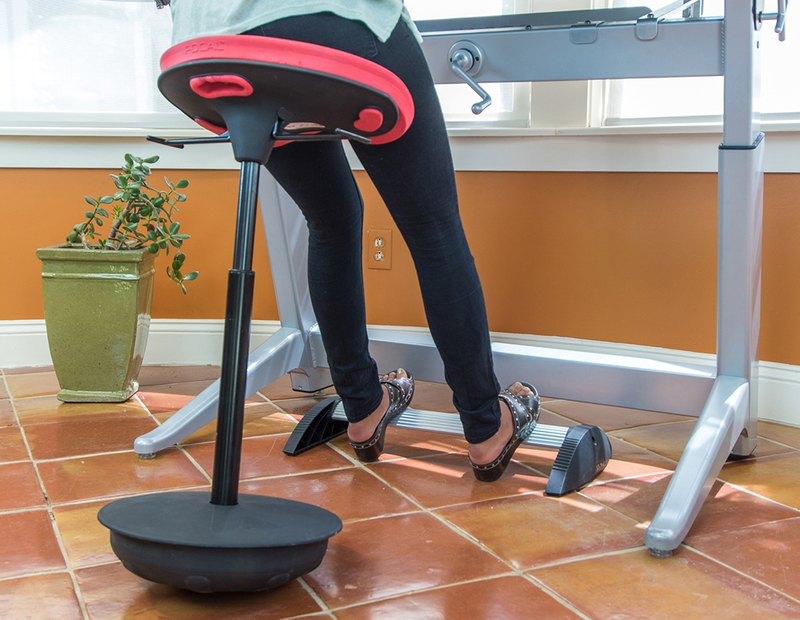 Encourages Correct Spinal Alignment and Upright Posture - When used correctly as a "leaning" seat, the Pivot Seat encourages users to adopt a "forward tilt" on the pelvis which naturally encourages the "S-curve" necessary for proper spinal alignment. This positions the head over the spine, ensuring that the back can provide the necessary support without fatigue. This also encourages a noticeably more upright stance, with a reduction of the forward bend of the neck. 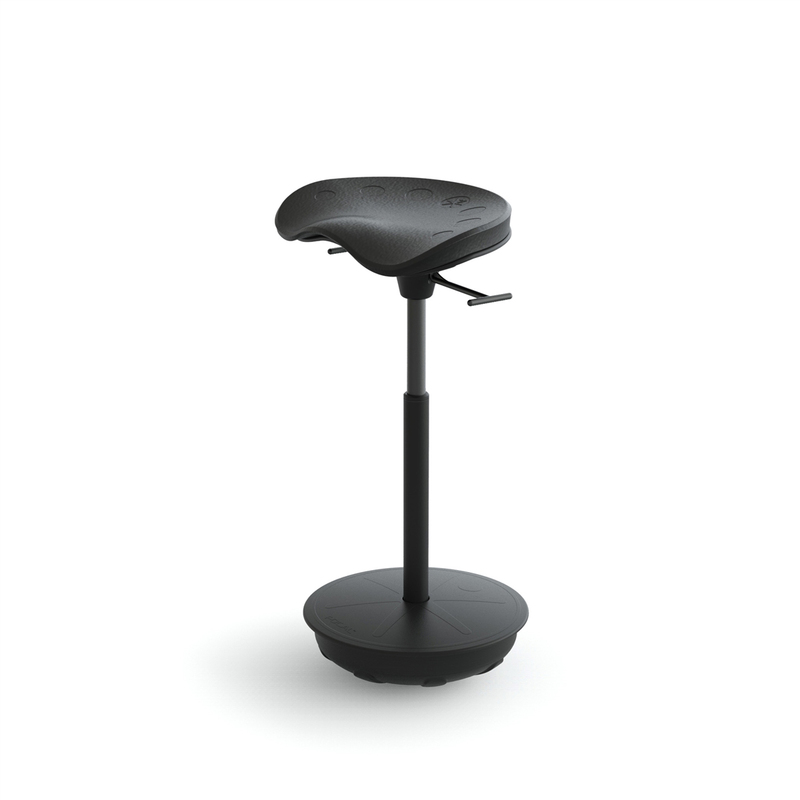 By combining the Pivot Seat with a correctly positioned monitor the head can be properly supported over the spine. Not only is this a relaxed position, it is also healthier and places less strain on the muscles of the neck and upper back. 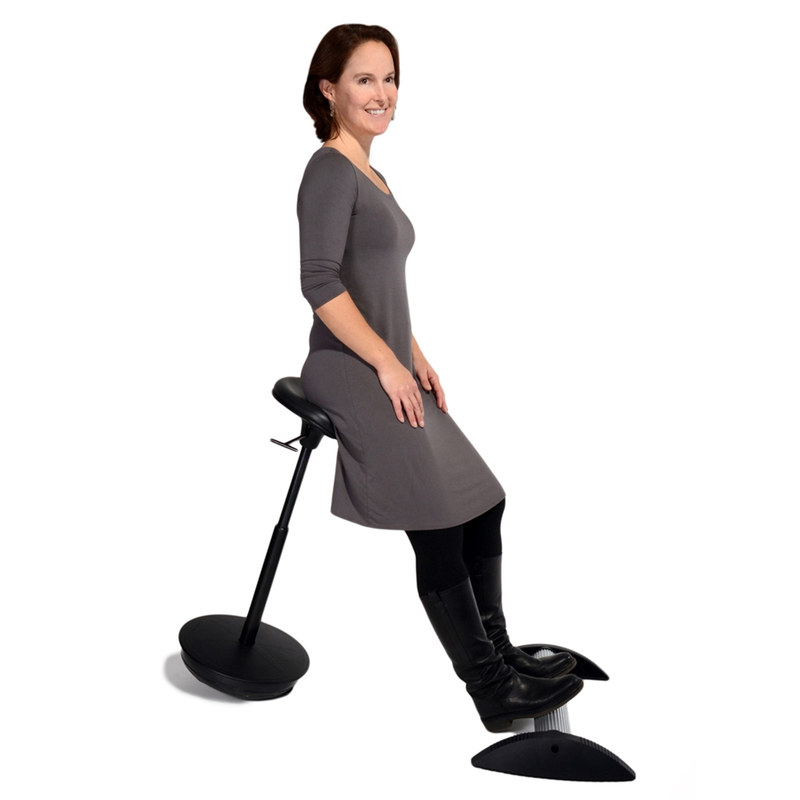 Reduces Weight Load on Legs and Feet - The Pivot Seat enables users to transfer 60% or more of their weight from their feet to the seat, thereby reducing the pressure on the joints of the lower limbs. This translates into reduced risk of damage to the knee and hip joints (which can occur when these joints remain under continuous strain from standing on hard surfaces). "Active Working" Dynamic - The "wobble base" of the Pivot Seat encourages users to actively move their body throughout the day. This movement can benefit the entire body as it will exercise core muscles in addition to the muscles of the legs. Flexing of the leg muscles is difficult when in a traditional standing position and can lead to swelling of the lower legs (edema) as blood and fluid collects in them. Relaxed activation of those muscles is encouraged by the Pivot Seat as the user shifts position and uses them to provide balance throughout the day. Although minimal, this minor flexing aids in moving fluids back into the circulatory system. 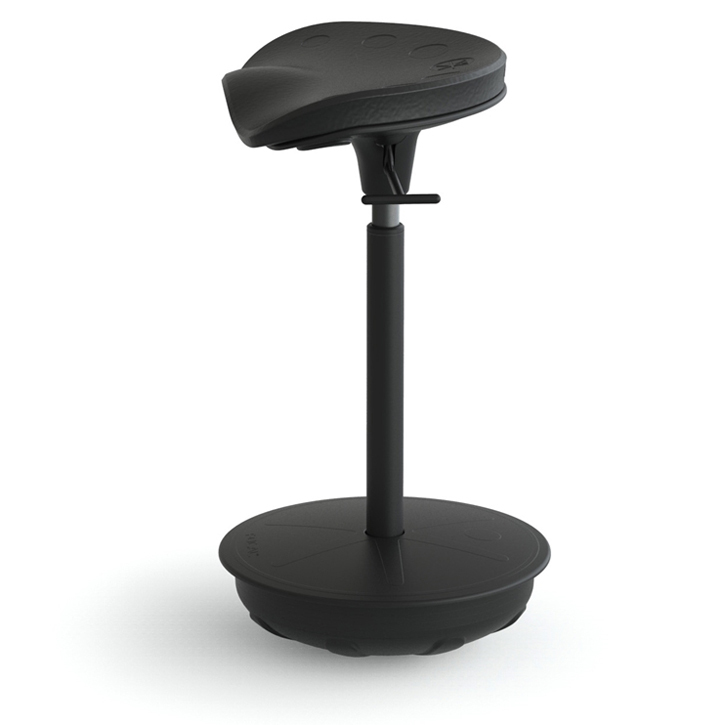 Improves Internal Organ Activity - The Pivot Seat enables users to easily achieve an "Open Core Stance" (optimized when the thighs are angled at approximately 130º to the torso) which reduces pressure on the internal organs. This means easier and deeper breathing as the lungs are no longer compressed and the diaphragm is not restricted. In addition, this stance and the resulting increase in movement also encourage a more active digestive tract and improves overall circulation. Increases Mental Alertness - The upright posture, deeper breathing, improved circulation, and increased ability to move all contribute to a greater degree of mental alertness as cardiovascular activity is significantly increased over that of a traditional static seated position. Reduces Risk of Lower Back Pain - For many people, standing in a static position for extended periods with the feet flat (such as at a standing desk), can lead to lower back pain. The muscles of the lower back are able to relax when the Pivot Seat is used to carry the weight as users lean on, or "into", the Pivot. In addition, when being used correctly as a "leaning seat", the natural S-Curve of the spine is restored, reducing the pressure on the vertebrae and soft tissues of the lower back. This can in turn reduce the risk of damage to this area. Expands Comfort Zone - The upright stance provided by the Pivot Seat, combined with the 360º pivoting and full tilting range of the seat, offers users a greatly extended reach which cannot be achieved with fixed leaning seats. This expands their comfort zone, providing access to a larger area of the worksurface while at the same time reducing the risk of overextension. Decreases Neck Rotation - The pivoting and tilting capabilities of the Pivot Seat provide users with a range of movement which traditional seating (chairs, stools, etc) cannot provide. Rather than relying on neck rotation to view to the sides, Pivot Seat users can rotate their entire torso since the seat freely rotates with body movement. 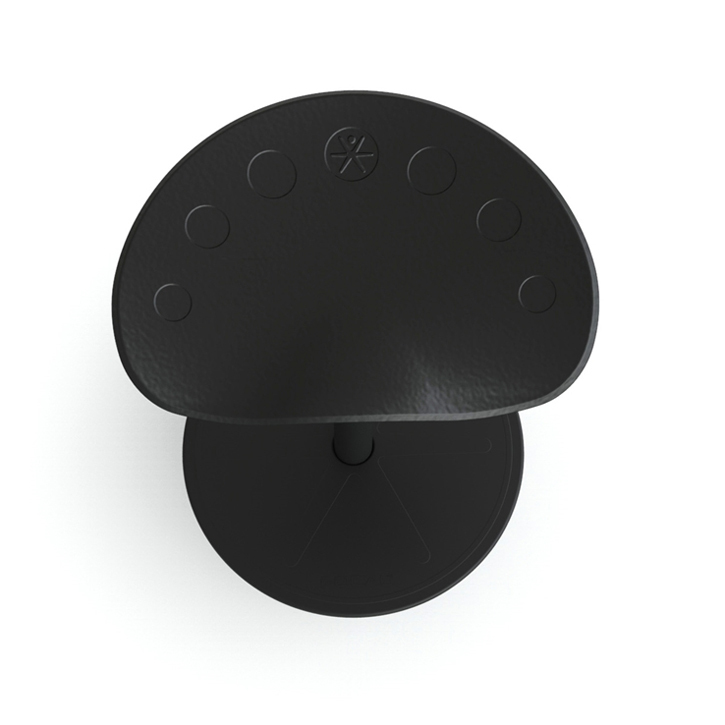 Unique "Wobble" Base: The Pivot Seat is mounted to a weighted bowl-shaped base which enables the seat to freely follow the movements of the body as users shift their position throughout the day. This ability to pivot and tilt the seat in any direction or angle encourages continual movement which triggers repetitive core muscle activation as balance is maintained. Adjusts to Fit the User: The Pivot Seat is height adjustable within a very wide range (26" - 35.5") which enables it to accommodate users ranging from 4'11" to 6'8" tall. Comfortable: The thick Tri-Flex Seat Cushion is naturally contoured to fit the sitz bones, providing secure and comfortable positioning for all users. 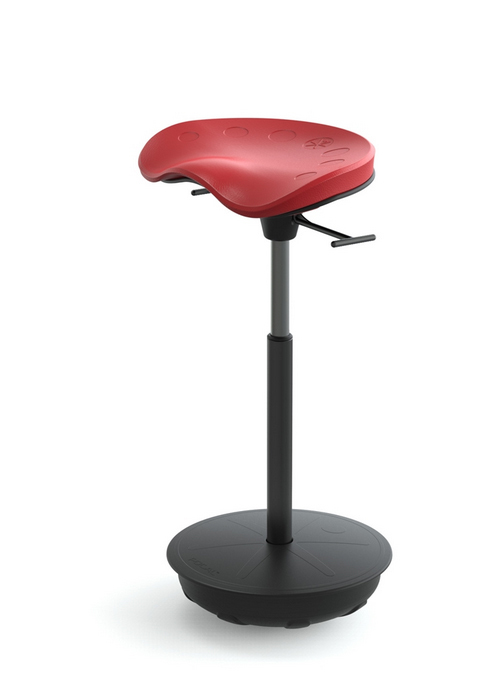 The front edge of the seat features a "waterfall" design which, combined with the ability to angle the Pivot Seat, can be quite effective at reducing or eliminating pressure points. Universal: The Pivot Seat is a perfect companion for any Standing Desk or Height Adjustable Worksurface. 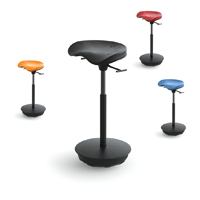 Portable (moderately): The compact design of the Pivot Seat means that it is moderately portable. However, with it weighing in at 25 pounds, the Pivot is less suited for portability than the Mobis or Mogo seats. The bowl-shaped base does facilitate easy movement to the side when switching from a "leaning/perching" to a "standing" position. Storable: Since the Pivot Seat can be lowered to 26" it can easily be stored out of the way when desired, even just tucked under the desk. Robust: The Pivot Seat is rated to support up to 300 lbs (136 kg). When using the Pivot Seat the optimum position is with the post of the seat angled forward and the seat elevated to where the thighs angle down at around a 45º angle. This angle will naturally encourage a forward tilt of the pelvis which in turn brings the back into a correct "S-Curve" alignment. This position offers the greatest degree of natural back support. Avoid using the Pivot Seat as a "chair". Lowering the seat to try to sit at a standard desk height will counter the benefits as described in the prior point. Sitting in this fashion - with a 90º bend at the waist - forces the lower back into an unnatural "C-Curve", rounding the lower back outward and greatly increasing the pressure on the discs of the lower back. This posture can aggravate existing lower back injuries and also increase the potential for new or additional damage to occur. Use the Pivot Seat as a "leaning" seat. This means that your workstation should be able to accommodate elevation to a height which will accommodate the 45º thigh angle as described in the first usage tip. This type of usage will offer the greatest potential benefits from an ergonomic perspective while also encouraging the greatest degree of movement which provide additional overall fitness and health benefits.